"What If You, Too, Could Have Multiple Streams of Income Like I Do, By Promoting Products And Services You Already Use And Love?" Affiliate marketing has been around since the early days of the Internet. It enables you to earn commission when you recommend products, courses, and services offered by others to the people on your list and in your sphere of influence. There's lots of profit potential with this business model, but a solid foundation and strategy must come first. I want to be the one to show you exactly how to do this. My name is Connie Ragen Green, and I've been making money as an affiliate marketer since the spring of 2006. Back then I had no products of my own, and I was anxious to start making money online. I decided to write a book on how to train Yorkshire terriers, because I owned a Yorkie and had been successful in training her. My first step was to research that niche and see if it had possibilities. There were more than a hundred thousand searches for this topic, so I figured that had to be a good sign. Then I looked to see if there were already products being offered in this particular niche. It turned out there was an eBook that looked exactly like what I was thinking of writing. I ordered it for $37 and was amazed at how good it was. I decided that it made the most sense for me to promote this information instead of spending the next two or three months creating a similar product that might not be as good as this one. Within a few weeks I made my first affiliate sale and earned $21.60! That was in April of 2006, and was just the beginning of the five figure a month business I have now created. That's right. I'll show you exactly what to do to get started with affiliate marketing before you have created your own product. Once you have a product, you'll find that it's even easier to build an online business with this model, but you can learn more from watching how other people are already doing it than my experimenting on your own. The Affiliate Marketing Profit Secrets course will be taught in three sessions. I use webinars so I can show you exactly what to do and where to click. How to choose two profitable niches that you can promote forever! Even though I had worked in real estate and had my own business, I had a lot to learn about starting a business and marketing online. Everything was so different than anything I had ever done in the past. People kept telling me to create a product, but I was not sure how to do this or what niche to choose. I needed to see the exact process that was already being used by those who were successful online. Once I began promoting affiliate products in a few different niches it was like a bright light turned on for me. I could model the entire process from start to finish and begin to create my own products to fill the gaps of what was being offered already. This gave me the opportunity to start making money right away and to take my time creating my own info products and courses. I was the #1 affiliate for Armand Morin's contest in August of 2009. 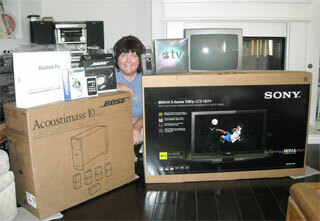 Here is a picture of me with some of the prizes, which included a flat screen television, a Mac Book Pro computer, a Bose home entertainment center, an iPod Touch, Apple TV, and assorted smaller electronics. Again in June of 2010 I won Armand's top prize as an affiliate. With just 650 names on my list I tied for 12th place in Alex Mandossian's Teleseminar Secrets affiliate contest in January of 2008, winning a variety of prizes. I continue to be a top affiliate for marketers such as Marlon Sanders, Christina Hills, Denise Wakeman, Lee McIntyre, Dennis Becker, and Dr. Jeanette Cates. In October of 2009 I was the top affiliate for WishList, the membership site plug-in created by Stu McLaren and Tracy Childers. In April of 2010, I was the top affiliate for Nicole Dean and Ronnie Nijmeh for the Rapid Product Formula course, scoring an iPad as my prize. I promised Nicole I would show her how much it meant to me, so here I am giving the iPad a big hug! In 2011 I have continued to win more affiliate contests, including one held by Marlon Sanders, another one from Nicole Dean, one from Dennis Becker, and yet another from Armand Morin. Remember that all of these prizes are in addition to the money you earn as an affiliate marketer for the sales that are made through your link. I am now able to make five figures a month using this business model, and my list has just recently hit the 4K mark. It was previously believed that you needed to have a list of 5,000 or even 10,000 before you could make any real money with this. I have shown that anyone can do this, even with a list of just a few hundred names. If your list is less than a hundred names, this course will show you how to start building it quickly with responsive people who are interested in purchasing what you are recommending to them. I want to thank you for the patience with us newbies in your Affiliate Marketing classes. As you know, this was my second go-round and it's beginning to click. I get impatient with myself, but I step back and tell myself I've only been trying to do this since June. Thanks again for everything you do! I just wanted to let you know that you are appreciated! My affiliate marketing efforts and results were in the gutter. When I attended Connie's Affiliate Marketing Profit Secrets course, I learned about an extremely critical step I was leaving out. I was directing my optins to the wrong location! I was also lacking a proven, step-by-step formula for setting up a series of effective follow-up messages. Just these two lessons alone were worth the fee for Connie's course! Anyone who is not making the money they want to with affiliate marketing should sign up for Affiliate Marketing Profit Secrets by Connie Regan Green. Connie shares how she earns income as an affiliate including her 10 x 10 X 10 strategy to drive traffic to your affiliate page. More importantly, you will be learning about affiliate marketing from someone who actually makes money with affiliate marketing. I recommend this course because not only do her strategies work, Connie is always there to answer any question I have about setting up my affiliate marketing campaigns. When I started with your course in 2008 I didn't know what I didn't know. Now I have an Internet business that I can do from home, and I'm consulting with business owners on two continents. You explained it so that I could apply the information to my particular situation, instead of providing a 'one size fits all' approach. That is a major change from what I had experienced with other Internet marketing courses in the past. Thank you for helping me to do what I love each and every day! I want to thank you for all the motivation you give me. Thanks to your courses I now have a 4-module online course. It was so exciting to get my first paying students. It's for people who have panic or anxiety and want coaching using self-hypnosis, cognitive and behavioral techniques. Thanks to your advice I created a new website and followed your step by program. It is so exciting to have this up and going. I'm about to launch the 2nd 4-module coaching course in May. Connie Ragen Green is the reason I am making money. During the last six months, 9 new clients asked me to help them - 3 professionals and 6 small businesses. The good news is that I work with most of them on a continuing basis. I have worked as a freelance writer for 27 years. I know how to write content, articles, blogs, and sales pages. Thanks to Connie I am also helping these clients establish an internet presence with their off line businesses or professions, without breaking their budgets. My clients really like me and I love Connie! I appreciate your availability and encouragement. About 9 years ago I got the idea of having a business online, but knew no one who did this. When I told my family and friends about it, they would nod and say "uh-huh..." not having a clue as to what I was talking about. I spent more money and time than I can tell you, bumbling around trying to figure it out. It is such a relief to be in your coaching group now. You explain everything in detail, and will go over it again for those who don't get it the first time. I am relieved and grateful for your services. You can learn all of this on your own, but it will take much longer and won't be near as much fun. I was so frustrated I almost quit several times, and I don't want you to ever feel that way. I am again teaching Information Product Creation, and I am including this three part course that is all new for 2011. I have taught this course previously and can tell you that it was wildly successful. More than 90% of my students complete their first product during the first 14 days of the course, allowing them to jump right in and sell their products and services on the Internet. Info product creation is a formula that can be repeated over and over. Once you learn how to set up everything and create products quickly, you will turn into a product creation machine. I have created more than 30 products in the past two years, so this is based on my own successful experiences. The value of this training alone is $247, and it is included here with my Affiliate Marketing Profit Secrets training. This training is now available for only $497. I've been told that I am insane to offer my intensive affiliate marketing course at this price, but I am still adding additional training and resources to the member's area and want you to be a part of it to give me feedback, and to share your success story. The Affiliate Marketing Profit Secrets training is set to be one of my most popular trainings on the Internet, and you can be a part of it to build your own online business. YES! I want to join the Affiliate Marketing Profit Secrets Course and have access to your training. Remember that I am limiting the number of students in this course because of the individual attention you will receive. P.S. Remember that you will also receive 2 full years in the membership site I have created to go with this training, at no additional cost or monthly fees. What are you waiting for?